People often ask me to recommend books to help them to learn aikido. Here I’ve put together a short list of some of the aikido books that I find most useful and instructive. Please bear in mind a few important points: 1) I would never recommend trying to learn aikido from a book alone. You must study with a qualified instructor. 2) This list is by no means comprehensive. There are many more books on aikido and some of them may be just as good as the ones listed below. However, these are the books that have proved most useful to me and I have no qualms in recommending them to other people. 3) Different ‘schools’ of Aikido (Ki, Iwama, Yoshinkan etc.) may use different variations on certain techniques. Moreover, each individual teacher may emphasise different approaches or use techniques that differ from those in these books. You should, of course, always follow your teacher’s advice. That said, I am very much of the opinion that students can learn from every great teacher. Even though my own ‘style’ is Ki Aikido, I am very open to learning from teachers of other styles and the books in my list are not all aimed specifically at students of Ki Aikido. Aikido and The Dynamic Sphere is a superb book. While probably no single book can claim to be the ‘definitive’ reference to aikido, this book comes very close. It is available in hardback and in paperback. Even though it’s expensive, I’d say the hardback edition is worth every penny. It does a great job of describing the techniques of aikido in a coherent and well structured way. But what really makes this book so great are the illustrations. The techniques are superbly illustrated and many of them are annotated with arrows to show the direction of force in each movement. My only caveat is that the book is so detailed that it may be a bit overwhelming for a beginner. However, if you’ve been practising a technique and want to study it in detail outside the dojo, this book cannot be beaten. 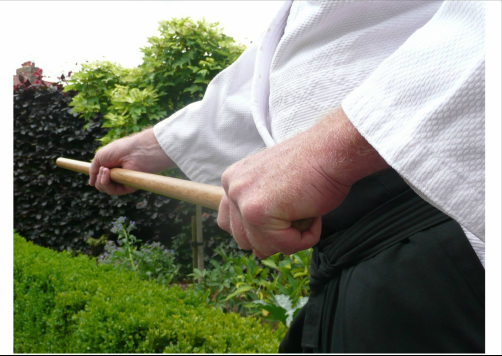 Aikido Exercises for Teaching and Training. I’ve only discovered this book quite recently. It was recommended to me by one of the high-ranking teachers in the British Ki Aikido Association – and I am really glad of the recommendation. It’s terrific. In principle, it is aimed at teachers of aikido rather than students and it includes many very useful tips on how to teach certain tricky techniques and how to explain some of the underlying principles. But I have to say that the techniques themselves are so clearly explained that I think this would be a valuable book for learners as well as teachers. But if you are a teacher, consider this essential reading. Aikido, The Co-ordination of Mind and Body for Self-defense. This is another ‘classic’ text. Written by Koichi Tohei under the supervision of Morihei Ueshiba (the founder of Aikido), the book was published in 1961 when Tohei was the chief instructor at Aikido Headquarters, many years before Tohei went on to found the ‘style’ of Ki Aikido. As a consequence, it may be regarded as an authoritative guide to Aikido as taught by Ueshiba at that time. This is a good reference to the essential techniques including the warm-up and ‘Ki Development’ exercises and it also has some short essays on the philosophy of aikido. It’s pretty well illustrated with some mostly rather grainy black-and-white photographs. Although not as slickly produced as some more modern books, it remains a good reference work. As far as I can see it is not currently in print but second-hand copies are available on Amazon and EBay. Aikido With Ki. Written by Koretoshi Maruyama under the supervision of Tohei Sensei in the early ‘80s, this book covers, to a large degree, much of the same ground as Tohei’s Aikido (reviewed above). Once again, the essential techniques plus the warm-up and Ki Development exercises are described and photographically illustrated. By the time this book was published, Tohei Sensei had founded the style of Ki Aikido and this book has more explicit references to the principles of “Ki training. The techniques are well explained and – as an added bonus for black belts – there is an appendix on how to fold your hakama. I have to admit that this is one of the arts of aikido that, to this day, I cannot claim to have mastered! As with Tohei’s book, new copies of ‘Aikido With Ki’ may be hard to find but second-hand copies are available. Now, since I teach Ki Aikido, ‘Dynamic Aikido’ may seem an odd choice. Written by Gozo Shioda, who founded the Yoshinkan school of aikido, several of the techniques described here are substantially different from the techniques as we normally practise them in Ki Aikido. Even the default ‘backward breakfall’ is different. Nevertheless, I have no hesitation in recommending this as one of my top books on aikido. It’s worth knowing a bit about Shioda in order to understand why and how his style of aikido is a bit different from the style taught in other schools. Shioda was one of Ueshiba’s senior students. He began studying with Ueshiba in the early 1930s and eventually founded the Yoshinkan style in 1955. It is sometimes said that Shioda’s style is representative of an earlier and ‘harder’ style of aikido whereas Tohei’s style is based upon the softer style which Ueshiba developed later in life. Well, maybe there’s some truth in that. Though, anyone who’s practised Ki Aikido at a high level will tell you that ‘soft’ is certainly not the whole story! And I am not really sure that ‘hard’ is a correct description of Shioda’s style either. A better description might be that Shioda’s style is more direct with lots of ‘entering’ throws whereas Ki Aikido tends to be more indirect with lots of turning and deflecting throws. At any rate, if you have any doubt about just how good Shioda was, go and watch some of his videos on YouTube. He was one of the great masters and I defy anyone in any style of aikido to suggest that they are incapable of learning from him. In my view, ‘Dynamic Aikido’ is one of the core texts of Aikido and deserves to be studied by practitioners of all aikido styles. It is beautifully illustrated both with line illustrations and with photographs of Shioda performing the techniques, many of the photos being annotated with lines and arrows to emphasises the critical angles and directions of force. A very good book indeed, even if some of the technical details may differ from those taught by other aikido styles.